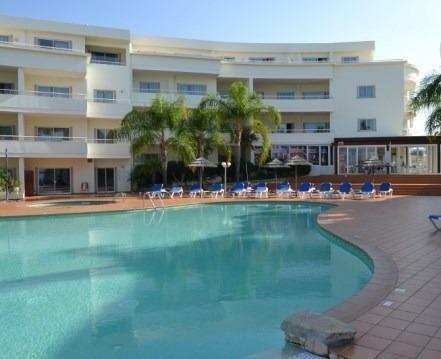 2 bed apartment exclusive Porto do Mos beach - Property for sale. Full Description: This 2 bed, 2 bath, fully furnished and equipped apartment is located in a luxury condominium with just a two minute walk to the exclusive Porta da Mos beach in Lagos. The apartment is on the 1st floor, with lift and has lovely views from the terrace over the surrounding hills and ocean. Accommodation comprises of an entrance hall, fully fitted and equipped kitchen, bright and spacious lounge/dining room with doors leading to terrace with ocean and hill views. There are 2 double bedrooms with fitted wardrobes, the master with en-suite bathroom and views over the swimming pool. There is also a further full bathroom. Other benefits are air conditioning and private parking.